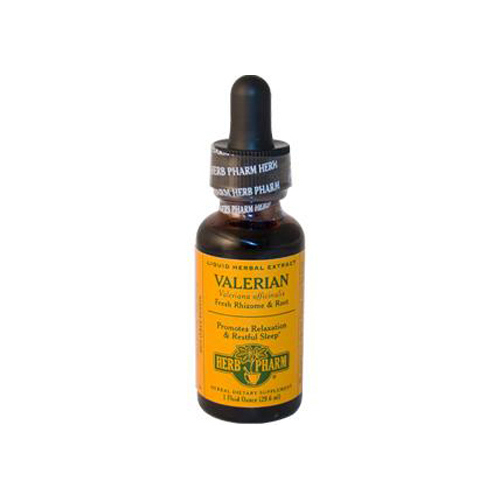 Herb Pharm Valerian Liquid Herbal Extract Description: Promotes Relaxation and Restful Sleep We prepare our Valerian Extract from the fresh (undried) rhizome and roots of Valeriana officinalis plants which are Certified Organically Grown on our own farm without the use of chemical fertilizers, pesticides or herbicides. To assure optimal extraction of Valerian's bioactive compounds, the rhizome and roots are hand-harvested in late autumn or early spring and are then taken directly to our laboratory and promptly extracted while still fresh and succulent. Our Valerian is never fumigated or irradiated. Free Of Fertilizers, pesticides, and herbicides. Disclaimer These statements have not been evaluated by the FDA. These products are not intended to diagnose, treat, cure, or prevent any disease. Shake well before using. Two to five times per day take 30 to 40 drops in a little water. Ingredients: Certified organic grain alcohol, distilled water and valerian extractives.